and nobody is good without Your help. which You intend for us. 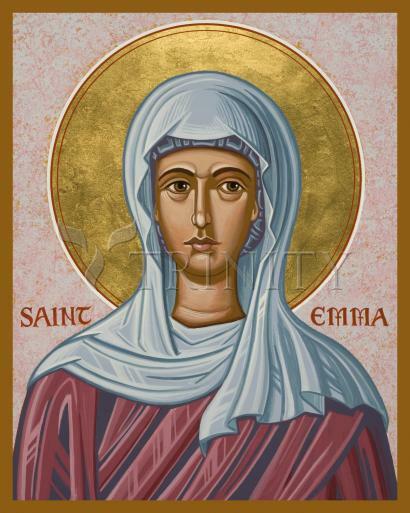 Saint Emma, also known as Emma of Lesum, or Emma of Stiepel, lived in the city that is Bremen today. She is the first female inhabitant of the city to be known by name. Emma lived in the early 11th century, and was born into the Immedinger family. The Immedingers were Saxon nobility descended from the legendary King Widuking, who fought against Charlemagne. Emma's father was a count, and her brother a bishop (Meinwerk of Paderborn). She married Liudger, the son of a Saxon duke. Their marriage resulted in one child, a boy named Imad. He would become bishop of Paderborn in 1051. Little specific information about St. Emma survives. Legend states that she had a violent temper when she was young. Emma's husband made a visit to Russia in 1011, fell ill and died. Following this tragedy, Emma withdrew into her faith. Her temperament became mild. She was a great benefactor of churches, establishing many small parishes. She donated to the Bremen Cathedral. Her concern for the poor was legendary. After her death, she was buried in a tomb in Bremen Cathedral. her tomb was opened. Her body had turned to dust exception for her right hand, which she used to give gifts. Her intact hand was sent to the abbey of St. Ludger at Werden.